Best known as the progenitor of the modern haiku form, Matsuo Basho is considered one of the most important figures in Japanese literature. Whereas the brief, seventeen- syllable poem form had traditionally been a vehicle for light humor and esoteric wordplay, Basho, drawing on the more somber and introspective modes of Chinese poetry, created haiku that used simple descriptions of nature and life to create a more profoundly expressive poetic form. Deserted Samurai Training. Although little is known about Basho’s early life, he is generally believed to have been born in 1644 in the Iga province of Japan. He was the son of a low-ranking samurai, in a time when the meaning of the term was changing. The samurai were an aristocratic class of warrior knights who practiced martial values and had elaborate rules about dress and behavior, as well as their own code of honor. While the samurai had recently received special privilege in this time period, there was little warfare after the early seventeenth century and they saw their power weaken as the ruling isolationist Tokugawa shogunate (military dictatorship) took hold. Basho became a page to Todo Yoshitada, a young samurai two years his elder; the young men became close friends, bonded by their mutual interest in haikai, a form of long poem from which haiku derives. Basho intended to become a samurai himself and even acquired a samurai name, Matsuo Munefusa, but he abandoned his training when his master died unexpectedly in 1666. Scholars attribute his decision both to grief over his friend’s death and his diminished hopes for his future as a samurai under a new, less amicable master. Became Acclaimed Haiku Master. Basho’s exact whereabouts during the next several years are unclear, but he is believed to have lived for some time in Kyoto (then the capital of Japan), where he studied philosophy and poetry and had verses published in at least four anthologies between 1667 and 1671. In 1672, Basho compiled The Seashell Game, an anthology of haiku written for a contest in which he judged and commented on the work of thirty poets, including himself. New Faith Led to Inspirational Journeys. Having achieved his longtime goals of artistic success and material prosperity, Basho increasingly felt a sense of purposelessness and spiritual disquietude. Consequently, he began the study of Zen Buddhist meditation and embraced an ascetic lifestyle at a time when Buddhism was essentially the government-required religion for every Japanese citizen. In 1684, he undertook a pilgrimage on foot across the Japanese countryside. Basho regarded his journey as an exercise in spiritual and artistic discipline, but it proved to be physically trying for him. He recounted his travels in The Records of a Weather-Exposed Skeleton, a diary of prose and poetry. For the remainder of his life, Basho continued to make pilgrimages, visiting religious and secular sites, spreading his ideas on haiku to fellow poets, and often begging alms for subsistence. His prose and haiku recollections of these travels, especially The Narrow Road to the Deep North, are considered his most accomplished and lasting literary works. Between journeys, he spent much of his time living and writing in secluded huts in the wilderness. In 1691, Basho returned to Edo, where he found himself again besieged by visitors. He struggled with a spiritual conflict between his religious desire to transcend worldly affairs and his poetic avocation, which focused attention upon himself. This conflict briefly forced Basho into self-imposed isolation in 1693, and the following year he began a series of travels along the Pacific coast of Japan. When his health declined rapidly that spring, he was forced to stop in Osaka, where he died of a stomach ailment that summer. Sir Isaac Newton (1643-1727): Physicist and mathematician, Newton's theories on gravitation and motion revolutionized science and defined the laws of the universe for centuries to come. Tokugawa Tsunayoshi (1646-1709): The great-grandson of the founder of the Tokugawa shogunate that controlled Japan's fortunes for 250 years, Tsunayoshi's reign was marked by a golden age in Japanese arts. Robert de LaSalle (1643-1687): French explorer who led expeditions around the Great Lakes region and down the Mississippi River. These explorations, which claimed the entire Mississippi River basin for France, would eventually lead to the formation of the Louisiana Territory. Ihara Saikaku (1642-1693): Creator of the ''floating world'' genre of Japanese prose, Saikaku—according to some reports—composed 23,500 verses in twenty-four hours in 1684. 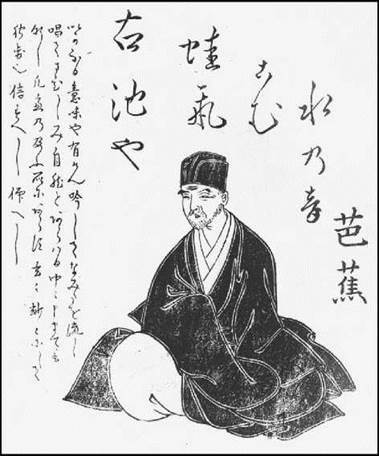 Although Basho wrote in various poetic forms—including the haibun, a prose poem written in a language and tone similar to the haiku and the renku, a longer poem written by several poets contributing alternating verses—it was in the haiku that he made his greatest contribution to Japanese literature. Prior to the 1670s, Basho saw poetry primarily as a pleasant diversion and his haiku from this period rely mostly on puns and parody for effect. Most critics remark that these poems evidence a spry wit, though little poetic merit. Indeed, the haiku form itself was not regarded as a serious form of literature at the time that Basho began to practice it. Rather, it was considered a light intellectual exercise. Danrin Movement. After moving to Edo, Basho committed his efforts to establishing himself as a poet. His poetry became more distinguished and inventive when he became associated with the Danrin movement in Japanese haiku. The Danrin poets, among whom Basho soon became acknowledged as a leader, sought to expand the scope of the haiku beyond that of urbane witticisms. They produced poems that were more concerned with the common experiences of everyday life than with intellectual and courtly humor. It was not until roughly 1680, however, when he became established as a haiku master and teacher, that Basho began to make the stylistic renovations that would elevate haiku to its position as one of the dominant literary forms in Japan. Modeling his writing after Chinese poetry, which is traditionally more understated and serious in tone than Japanese verse, Basho began to write haiku that evoked deep emotions through simple and almost purely descriptive language. Zen Buddhism. Influenced by his study of Zen meditation, his haiku of the early 1680s became contemplative studies in which he attempted to recapture fleeting moments of his experience. One of Basho’s most famous haiku, often cited as the poem that marks this turn in his career, reads: ‘‘On a bare branch / A crow is perched—/ Autumn evening.’’ These haiku generally depict scenes from nature, often linking together disparate images to create an implied mood. They relied for their effect on the reader’s interpretation of the images described rather than on any explicit statement. Although these haiku were intended to evoke an emotional response, they were not meant to express personal emotion unlike traditional Japanese poetry in which the imagery served as a mirror of the poet’s own feelings. ‘‘Learn about a pine tree from a pine tree, and about a bamboo plant from a bamboo plant,’’ Basho advised; that is, the role of haiku poets is to capture in words the inner nature of their subjects and in order to do this they must detach themselves emotionally in their writing. Most critics contend that Basho began composing his finest haiku after 1684, when he began making pilgrimages and writing his famous travel diaries, in which he intermingled prose and poetry. Loneliness and Lightness. It was during this time that Basho formulated the concept of sabi as an essential for the haiku poet. Derived from the Japanese word for loneliness, sabi refers not to emotional solitude but to what Basho considered the proper mood for a haiku: the poet’s awareness of the transiency of individuals and objects. In his later poems, Basho often juxtaposed images of short-lived phenomena with those of a more enduring nature, as in the poem, ‘‘The old pond. / A frog jumps in / The sound of the water.’’ Here, Basho contrasts a momentary splash with an ‘‘old’’ natural feature, evidencing the relationship between the ephemeral and the eternal that concerns much of Zen philosophy. Furthermore, sabi suggests the sense of quietude that imbues many of Basho’s haiku. A second major principle informing Basho’s later poetry is that of ‘‘lightness.’’ That is the poet’s bemused and detached acceptance of the impermanence and imperfections of the material world. It is important to note that, for Basho, these principles of poetry were also principles of living. He saw his philosophy as inseparable from his poetry and advocated the concepts of sabi and lightness as part of one’s attitude toward life. Indeed, many critics have noted that Basho developed these principles at times of crisis in his personal life. They contend that these principles helped him to reconcile the conflict between his religion and his desire to write poetry, which he sometimes disparaged as a ‘‘sinful’’ practice that jeopardized his dedication to Zen. Helped Define Japanese Poetry. Basho’s influence on later Japanese poetry is such that many subsequent literary movements have defined themselves to some extent in terms of their relationship to Basho. Poets of the Haikai Restoration movement of the eighteenth century took as their motto, ‘‘Return to Basho,’’ and the Japanese symbolist poets of the early twentieth century adopted many of the techniques employed by Basho in his haiku. Wild Ways: Zen Poems of Ikkyu, by Ikkyu (1995). Ikkyu was a fifteenth-century Buddhist monk known for his hedonistic, almost heretical take on Zen as well as his contributions to creating the formal tea ceremony. His poetry is as eccentric as his life. One Robe, One Bowl; The Zen Poetry of RyOkan, by Ryokan Taigu (1977). An eighteenth-century Zen monk who lived most of his life as a secluded hermit, Ryokan's poetry is equal parts gentle humor and quiet meditation on nature. The Zen Poetry of Dogen: Verses from the Mountain of Eternal Peace, by Dogen (1997). The thirteenth-century Zen philosopher Dogen is perhaps better remembered for his koans, short parables meant to aid in the path to enlightenment, but his poetry is equally respected. So completely was Basho venerated in Japanese letters that negative criticism of him began to appear only after the end of the country’s isolationist period in the nineteenth century, when many Japanese, embracing the Western emphasis on individualism, began to fault Basho’s de-emphasis of the idiosyncrasies and personal emotions of the poet. Outside Japan, Basho has been cited as a direct or indirect influence upon many poets who took inspiration from haiku—most notably Ezra Pound. Basho is generally acknowledged as the greatest poet ever to write in that form, as much for his integration of poetry, religion, and philosophy into an all- encompassing way of life as for his stylistic innovations. 1. Basho was a devout practitioner of Zen Buddhism. Research the tenets of that religion, and analyze the Zen concept of the eternal that marks Basho’s verse. 2. Summarize Basho’s contribution to the art of traditional haiku. What was haiku like before Basho? How has it changed since his day? 3. Try writing your own haiku. Take note of some basic, striking truth of nature and record it in three lines—five syllables in the first, seven syllables in the second, and five syllables in the third. For this type of poem, there is no need to explain the significance of the event, only to record it clearly. 4. Discuss the haiku format. Do you think that it is too confining, or does it spare the poet the problem of having to choose a style? Do you think haiku writers would overexplain if they could use more words? 5. Compare Basho’s ‘‘Temple Bells Die Out’’ with a haiku written by a modern Asian American writer, Diana Chang’s ‘‘Most Satisfied By Snow.’’ Explain how the haiku style, as displayed in this poem, appears to have influenced Chang’s style, and point out similarities in the two poems’ ideas. Aiken, Robert. A Zen Wave: Basho’s Haiku and Zen. New York: Weatherhill, 1979. Blyth, R. H. ‘‘The Four Great Haiku Poets.’’ In Haiku, vol. 1. Tokyo: Hokuseido, 1949. Campbell, Liberty. To a Far Province with Basho. Coraopolis, Pa.: J. Pohl Associates, 1983. Downer, Lesley. On the Narrow Road: Journey into a Lost Japan. New York: Summit, 1989. Henderson, Harold Gould. ‘‘Matsuo Basho’’ in The Bamboo Room: An Introduction to Japanese Haiku. Boston: Houghton Mifflin, 1934. Kyorai, Mukai. ‘‘Conversations with Kyorai’’ in Anthology of Japanese Literature from the Earliest Era to the Mid-Nineteenth Century, Donald Keene, trans. and ed., New York: Grove Press, 1955. Ueda, Makoto. Matsuo Basho. Boston: Twayne, 1970. Fujikawa, Fumiko. ‘‘The Influence of Tu Fu on Basho.’’ Monumenta Nipponica (1965) vol. 22, nos. 3-4, pp. 374-88. Literature East and West (September 1965): vol. 9, 32, pp. 32-37.